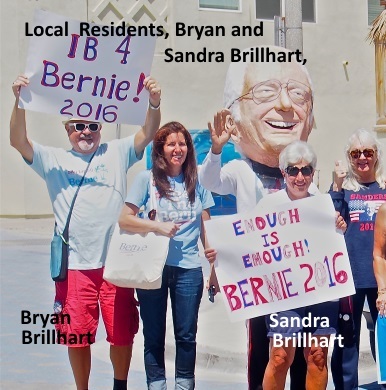 Local Residents, Bryan and Sandra Brillhart, are running to be Bernie Sanders Delegates in 51st District for Democratic National Convention! Last Saturday, April 23rd, both Bryan and Sandra were heavily involved with the "Enough is Enough Walk" that started at 10am at the corner of Palm and Seacoast Drive and ended up at Veterans Park and lasted until 2pm. Bryan and Sandra want you votes to represent Bernie Sanders at the Democratic National Convention! The Democratic Party Caucus for Bernie Sanders that it being held for our District on May 1. Bryan and Sandra are running for delegates and want to get the word out about the caucus. Any registered Democrat in the 51st District can come to the caucus to vote for them. The caucus is on Sunday, May 1 at the IBEW Union Hall. 4545 Viewridge Avenue, San Diego from 2-4 pm.